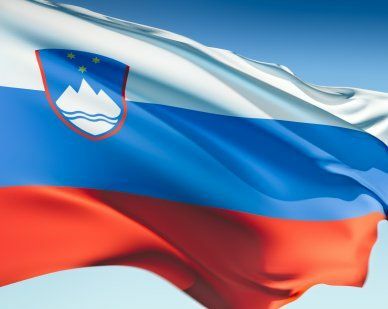 Slovenia gained its independence from Yugoslavia in 1992 and adopted its nation flag the year before. Featuring three horizontal stripes of white, blue and red, the flag also boasts the nation's coat of arms which was designed by Slovenian artist Marko Pogacnik in 1991. The coat of arms bears the image of the country's highest point: the triple-peaked Triglav Mountains. Our top-quality Slovenia flags conform to all official specifications. Emblems and designs are executed with the highest possible degree of accuracy in regard to detail, color shades, placement and proportion to flag size.